"I ask Mary to guide me and my career. . . This film is something that I believe was made by Mary for her Son. Because it was made by her, it will be attacked by the enemy." Jim Caviezel in an interview. A Movie About the Coming Anti-Christ? Mel has a one eyed icon as his logo for ICON PRODUCTIONS . 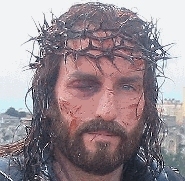 Jesus' right eye is swollen shut at the beginning, never to open again throughout the movie. 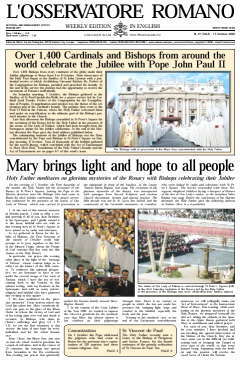 The movie is based on a large part on Ann Catherine Emmerich visions of Christ, who is pictured on the website of the Order of Brothers of Saint Augustine, an international Catholic religious community as in bed with one eye in a pyramid over her, enlighten her with the visions to write the book which later Mel used for The Passion of the Christ. 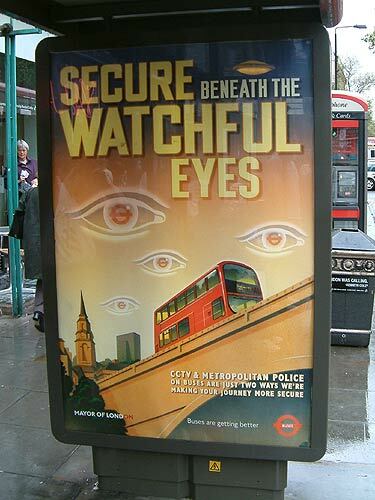 We also find "one eye in a pyramid" of Freemasonry, just like with Ann Catherine Emmerich visions of Christ. This is interesting to anyone who knows of the Fascist P2 lodge that were found in Rome. We here at King James Bible Believer's of the North have been told over and over again by loving Catholics, (who would never think about cutting the fingers off one by one of any Bible believer to provoke him/her to confess the death, burial, and resurrection of Christ and thereby asking forgiveness to Mary the Co-Redemptrix, before using the passion of the Christ by burning them to death, thus entering heaven as a true Christian Roman Catholic); we have been told it is only Catholics who are acting outside the Church that would think of such things. If this were true, the Pope himself would be acting outside of his own Church! Gibson goes on to calmly condemn his own wife to hell. Mel readily admits that she "believes in God" and "she knows Jesus" – but that is not enough. According to Gibson’s own words, "knowing Jesus" will not save a person. Mel Gibson clearly believes "There is no salvation for those outside the Catholic Church." "Put it this way. My wife is a saint. She’s a much better person than I am. Honestly, She’s, like, Episcopalian, Church of England. She prays, she believes in God, she knows Jesus, she believes in that stuff. And it’s just not fair if she doesn’t make it, she’s better than I am. But that is a pronouncement from the chair. I go with it." The "pronouncement from the chair" Gibson is referring to is the pronouncement by the Pope, which to Catholics, is literally the voice of God and infallible. The "chair" has more authority than the Bible. The Catechism of the Catholic Church number 780 says, "The Church in this world is the sacrament of salvation, the sign and the instrument of the communion of God and men"
The Deception is very great in these last days! Churches who have given themselves over to rock and roll music, Westcott and Hort perverted Bible versions, Harry Potter, Promise Keepers, the Alpha Course, and other compromises will love and accept this movie! Many professing Christians today are basing their faith upon the lustful pagan emotions of Catholicism, hoping one day to enter back into the womb of their spiritual mother Mary - Queen of heaven. This pagan faith of the son committing fornication with his mother can be found back at the very beginning of time with Nimrod, who founded the city of Babel (Genesis 10:9-10). "On June 24th, 1981, at about 6 pm, six young people - Ivanka Ivanković, Mirjana Dragićević, Vicka Ivanković, Ivan Dragićević, Ivan Ivanković and Milka Pavlović, saw on the hill called Crnica, several hundred meters above the place called Podbrdo, a young woman with a child in her arms, who gave them a sign with her hand to come nearer. Surprised and scared, they did not approach her." 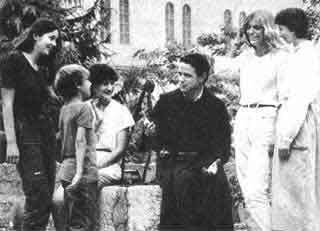 "The next day, June 25th, 1981, at the same time, four of them: Ivanka Ivanković, Mirjana Dragićević, Vicka Ivanković and Ivan Dragićević, felt strongly drawn towards the place where they had seen the person the day before which, they had recognised as Our Lady. Marija Pavlović and Jakov Čolo joined them. 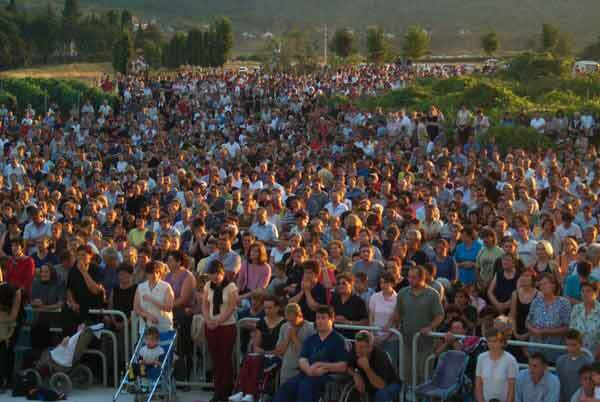 The group of Medjugorje visionaries was formed. 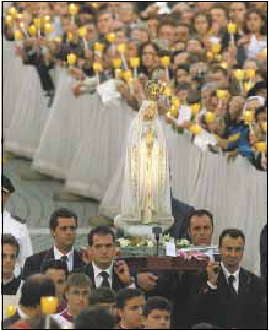 They prayed and spoke with Our Lady. This is why June 25th is celebrated as the Anniversary of the apparitions. According to the testimony of the visionaries, from that day onwards, they had daily apparitions, together or separately, wherever they were. 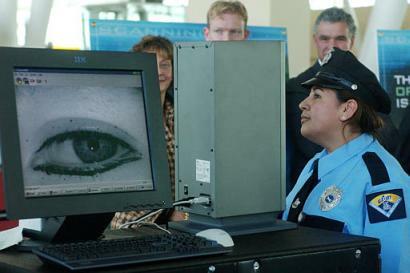 Milka Pavlović and Ivan Ivanković never saw Our Lady again. " 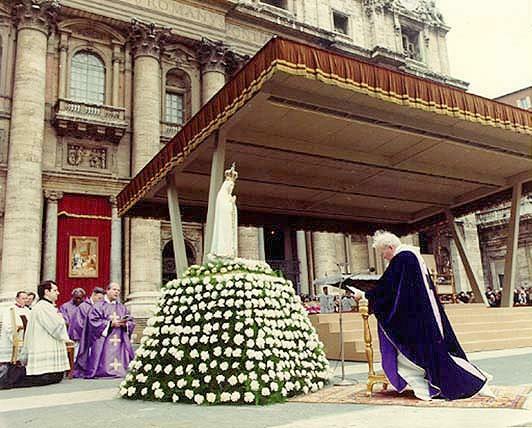 "The third day of the apparitions, June 26th, 1981, Our Lady gave the call to peace for the first time with the words: “Peace, peace, peace – and only peace! 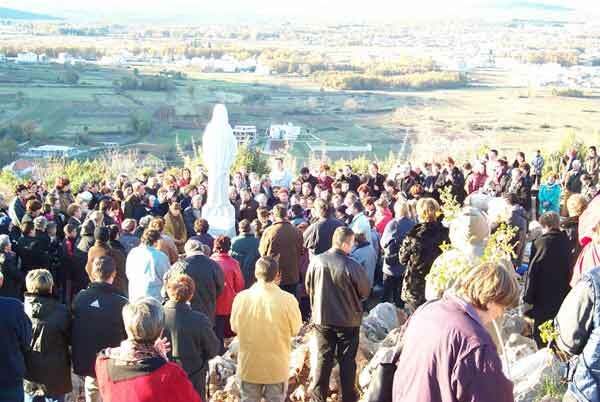 Peace must reign between God and man and between men!” Attracted by Our Lady’s apparitions and messages, people – first the parishioners and then from other villages and from all over the world – started to gather and pray." 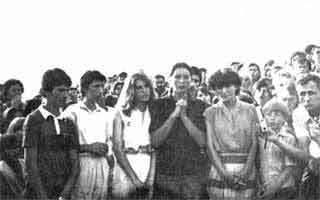 Jozo Zovko, Catholic pastor of Medjugorje at that time, was arrested a month and a half after the first apparition. 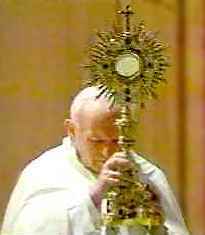 The Serb government arrested him for his support in using the satanic apparitions to place the Ustashi back in power. 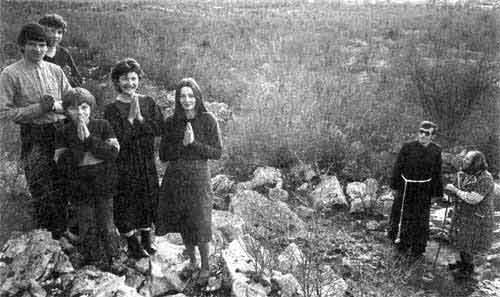 The place of the first apparitions is today called Apparition Hill. At the very place of the apparitions, in honour of the 20th anniversary of the apparitions, a statue of "the Queen of Peace" was placed, sculpted according to the model of the statue, which you can find in front of the parish church (the work of Dino Felici). Interview Jim and Kerri Caviezel "We were told that it was true. We were from a mixed catholic community: mostly Croatians and Italians. 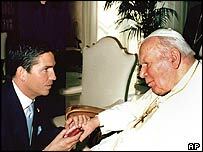 My grandmother is a 100% Croatian...I pray that we are open to wherever Mary is leading us"
"The movie, called The Passion, is using actual Aramaic dialogue and stars Jim Caviezel who, underwent a conversion after visiting with a seer from the famed apparition site of Medjugorje." T"he Passion of the Christ and His Mother is perhaps the most detailed, inspiring and moving account of the Passion of Christ you will ever read. Find out more about the revelations from the Venerable Anne Catherine Emmerich, a full account of the Last Supper, medical aspects of the crucifixion and theological explanations of why The Passion was necessary. Both Mel Gibson's film "The Passion" and Professor Bartholomew's book are sure to spark controversy and debate but, above all fuel the fires of faith for years to come." Queenship a Catholic publishing ministry in 1993. "This book helped inspire Mel Gibson to make the movie, "The Passion of the Christ." Faithful to the Bible story of the Passion and death of Jesus, it fills in many details and is edifying and inspiring beyond belief; plus, it is surprising and heart-rending. It will melt a heart of stone. This book is the best on the Passion we have seen. It is also wonderful on the Blessed Mother's role in our redemption. Includes a short biography of Sr. Emmerich. A great, great book for the whole family!" Sister Anne Catherine Emmerich (1774 - 1824), a mystic, stigmatist and visionary. Toward the end of her life, she bore the wounds of Christ, ate no food save the Catholic mass, and. was in ecstasy a great deal of the time. It was during these ecstasies that she witnessed in vision the details of Our Lord's life which are recorded in this book. The above nonsense is alive even today! According to her biographer, as a child Catherine received visitations from Jesus and John the Baptist, who appeared to her as children like herself. 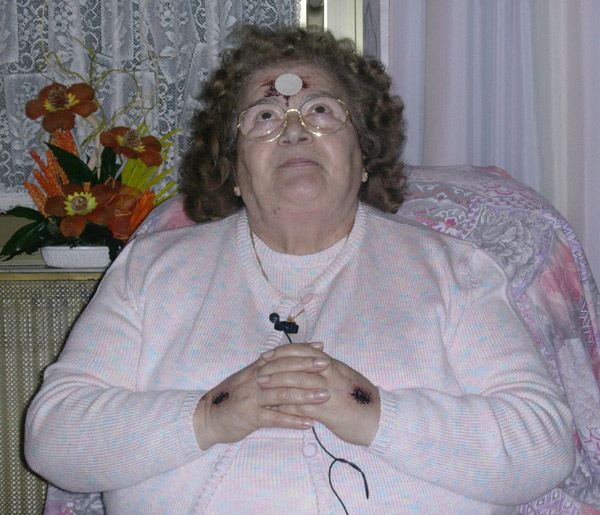 In 1799, shortly after she entered the Augustinian convent in Dülmen, near her birthplace in Westphalia, she began to bleed from a ringlet of tiny wounds around her head and three years later exhibited the stigmata on her hands, feet and side. Only modestly educated, she never attempted to write down what she experienced, but she won the interest and admiration of the German Romantic poet Clemens Brentano. From 1818 until Emmerich’s death, Brentano sat frequently by her bedside and took down the words Catherine spoke during her ecstatic transports. Nine years after her death, Brentano published The Dolorous Passion of Our Lord Jesus Christ After the Meditations of Anne Catherine Emmerich. This is the book to which Mel Gibson referred, which in English translation runs to some 350 pages of relatively small print and is very anti-Semitic. The Catholic League purchased 1,200 tickets at $9.75 apiece and will make them available to members for $5. The film was shown to members of the Vatican Secretariat of State, the Pontifical Council for Social Communications, and the Congregation for the Doctrine of the Faith, and all of them expressed unanimous appreciation and approval. This is the same Congregation for the Doctrine of the Faith office that priests burned Bible believers at the stake. All Pagan Religion have a Male deity (see Christ above) and a female deity (see Mary above). Mel Gibson and Promise Keepers Team Up - You Have a Part to Play Too! "'The Passion of the Christ' is the most moving film I've ever seen. I've never encountered anything that I reacted to as passionately, or responded to as strongly, as I did this movie. This is a movie you have to see." Brilliant, biblical - a masterpiece. -Rick Warren, Pastor, Saddleback Church and Author of "The Purpose Driven Life"
In my opinion, one of the great achievements of this film is to have shown so effectively both the horror of sin and selfishness, and the redeeming power of love. Seeing this film provokes love and compassion. It makes the viewer want to love more, to forgive, to be good and strong no matter what, just as Christ did even in the face of such terrible suffering. The viewer is drawn into a powerful experience of God’s strong yet gentle love, of his overflowing mercy. It is my belief that if we could understand what Jesus Christ did for us and we could follow his example of love and forgiveness, there would not be hatred or violence in the world. This film will help to make that possible. Film makers are the history teachers of our culture -- and Mel Gibson's movie, "The Passion of the Christ," teaches us about history's most important event. The impact of this movie will be immeasurable. -Mark Mittelberg, Author, "Building a Contagious Christian"